The beginning of the school year’s here, and kids and young adults are settling into the academic semester. Teachers and professors do the same as they welcome a new cohort of students to their classrooms. Excitement’s in the air as old and new friends reunite at school. During this time, and all year round, it’s important to stay organized so students can too. The appropriate desks, chairs, and tables encourage success and allow for collaboration. It’s equally as important for staff to have the furniture and materials they need to conduct everyday academic activities. 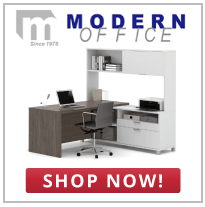 At Modern Office, we provide a large selection of furniture for a variety of settings – including the classroom. Whether you need to buy a new lecturing podium or a set of desks, you can count on us to deliver quality furniture that students and staff will use for years to come. Consider decorating classrooms, lectures halls, and administrative offices with these popular pieces. Collaboration is key in academic settings. Teacher-student discussions foster higher learning and encourage students to work together to solve difficult problems. Teacher-parent meetings also take place around a well-kept desk, providing an honest space for more serious discussions. Desks provide the physical foundation for creativity, collaboration, and success – which is why we offer a large selection of desks for different uses. Our study carrels are a great option for students needing a private place to study. Constructed with one-inch thick core board with high-pressure laminate, these desks are sturdy and resist marks from heavy use. Teachers also need comfortable working spaces to grade papers and address their classes. Our adjustable height desks allow you to sit or stand at work – a handy feature for lecturing on lengthy topics. Think on your feet and move up and around as you explain the fall of the Roman Empire or write the quadratic formula on the whiteboard. Perhaps, you don’t even need a desk, and a podium is more your style. Our selection of sound lecterns and speaker systems offer stability as you lecture on your feet. For administrative uses, consider investing in a traditional executive desk to assert your leadership skills and experience. They’re suitable for any working professional and decorate administrative offices nicely. Choose from cherry wood and oak finishes to enjoy a desk that’s useful and beautifully made. Students learn and accomplish something every day at school. The baseball team wins a series of home games and the debate team is victorious in a battle of wits. Or maybe you want to highlight memorable gatherings like homecoming, prom, and service-related projects. Display and trophy cases are perfect for showcasing accomplishments and can be placed in hallways or gyms for all to see. 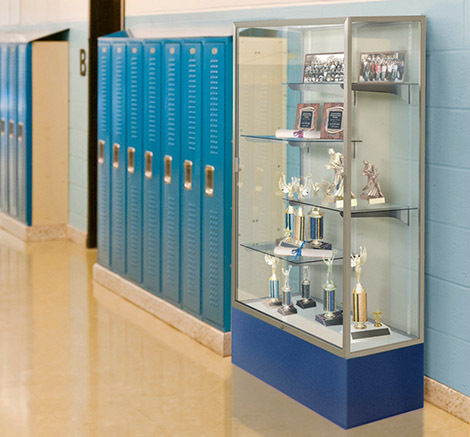 Our 77” Varsity Series Display Case is large enough to house a variety of trophies, products, and projects, making it a great addition to any school or university setting. This case is designed with elegance in mind and complements a variety of styles and décor. Choose from hinge or sliding doors and add in adjustable shelves as you see fit. Narrower cases made of different woods are also available for your convenience. With a large and varied selection for sale, our furniture suits many different styles and complements pieces already set in place. All you have to do is pick and choose the furniture that will work best for your school and students.